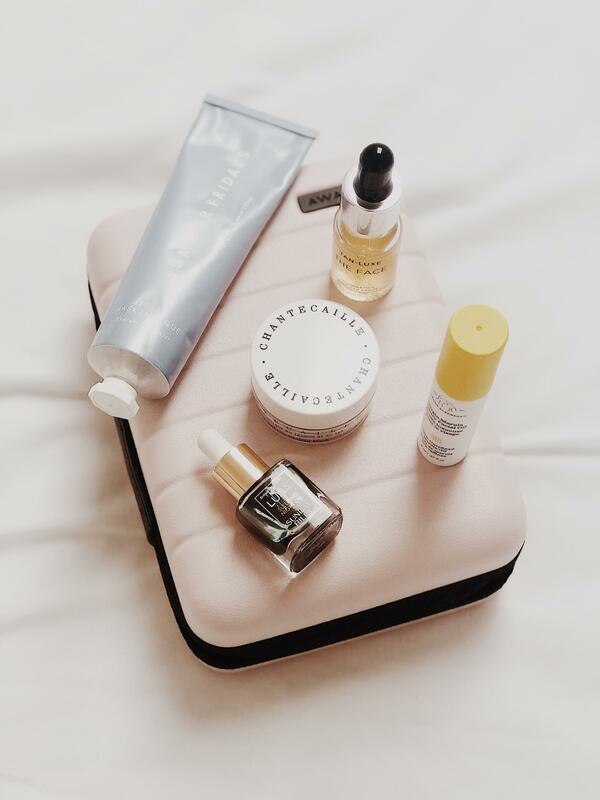 I have a round up of my travel skincare favourites, that I’m taking on my next trip across the pond. 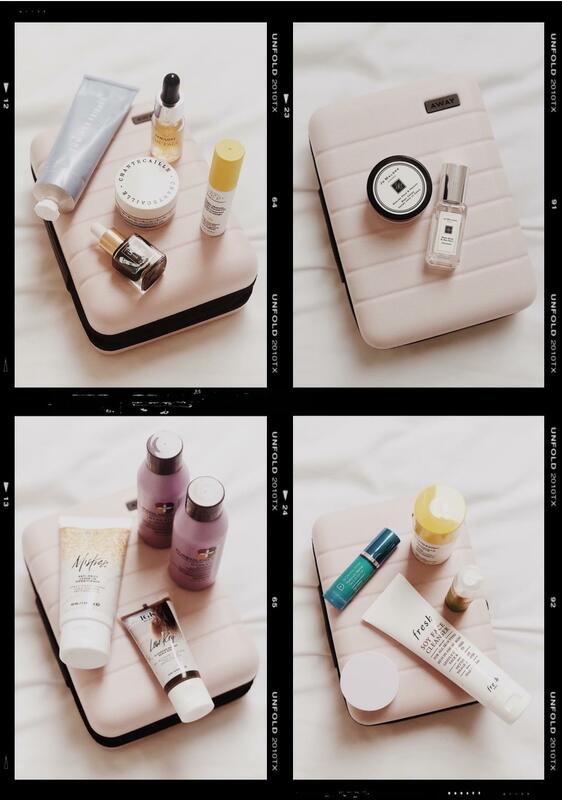 I do tend to over pack beauty items but i’m hoping by curating my favourites on the blog, I will stick to the products I actually need and use. I’ve found it difficult to pack for this trip as we are heading straight to Miami for 4 days, the weather there is hopefully going to be much better than the UK, I’ve heard 26 degrees – which is a complete luxury for us brits. Then after a short 3 hour flight we will land in New York City, where I’ve heard the weather is -12 and counting, gulp! I don’t think we really thought this trip through. Having said that, packing beauty items can be difficult when your dealing with two completely different climates. I’ve chosen products that can be layered or worn on their own, so hopefully my skin won’t have a freak out. I always pack face masks on trips because they’re a great way to add moisture quickly into the skin, especially after travelling! I sometimes pack a detox mask if I know my skin might misbehave whilst I’m away. This time around I have packed my Chantecaille Jasmine and Lily healing mask – this reduces redness, irritated and stress skin and is perfect pre flights. 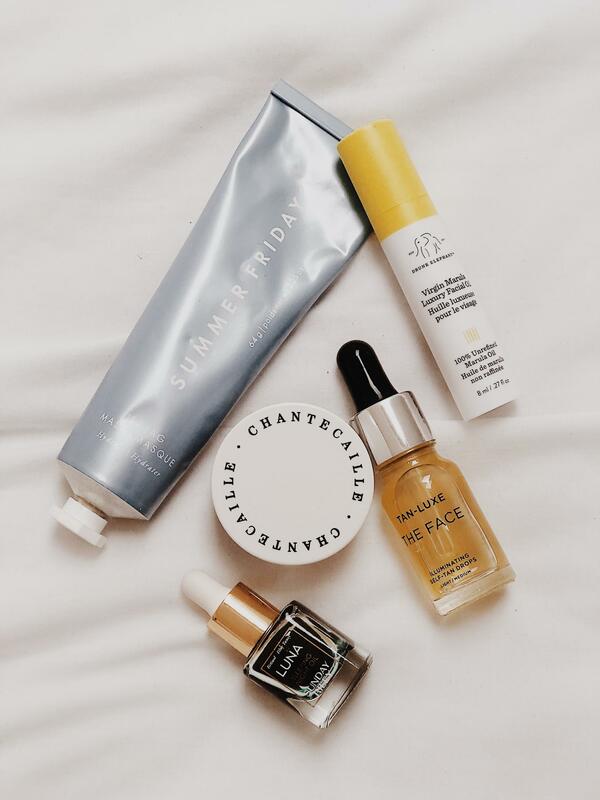 My favourite in-flight mask is summer Fridays Jet Lag, this plumping and hydrating mask is amazing at adding in moisture that’s lost on flights and helping sleep deprived skin. 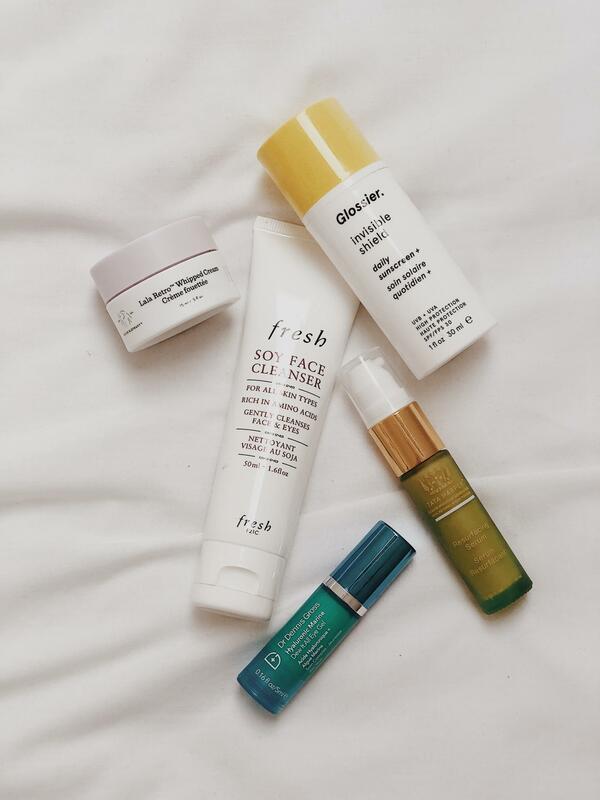 Night time treatments are a must for my skin all year found and my current favourites are Drunk elephant T.L.C Framboos Glycolic Night Serum, Sunday Riley Luna oil and Sunday Riley Good Genes. I alternate the nights when I use these products as they all have very similar ingredients. 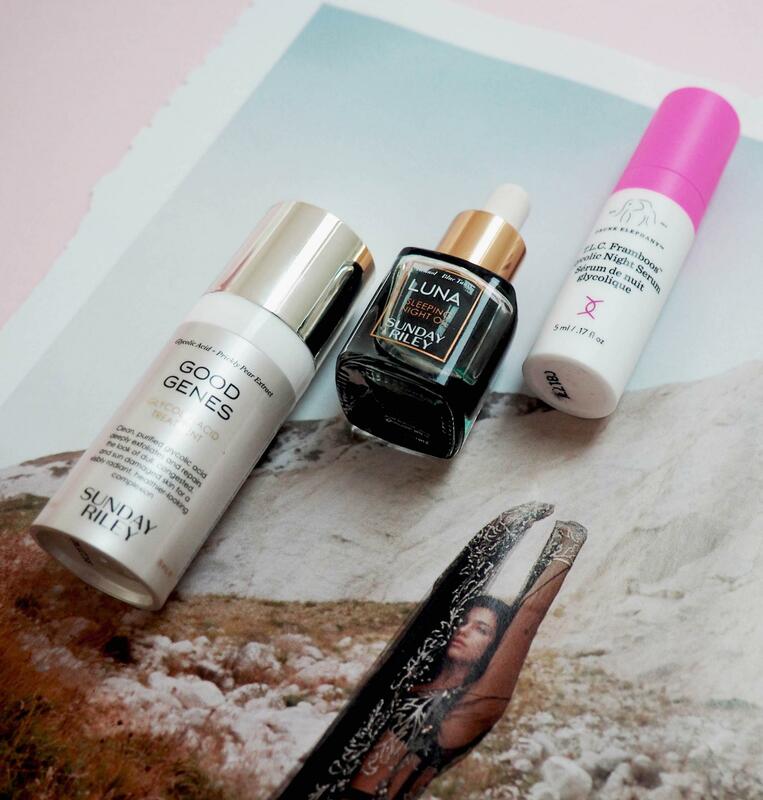 Sunday Riley Luna oil is always a skin saviour. It’s rejuvenating properties and retinol resurfacing makes for baby skin in the mornings, I alternate this with any acids such as the Dr Dennis Gross Extra Strength pads or Good Genes. For hydration and glow; Drunk Elephant Marula oil, I like to layer this over masks and face creams for an added boost. 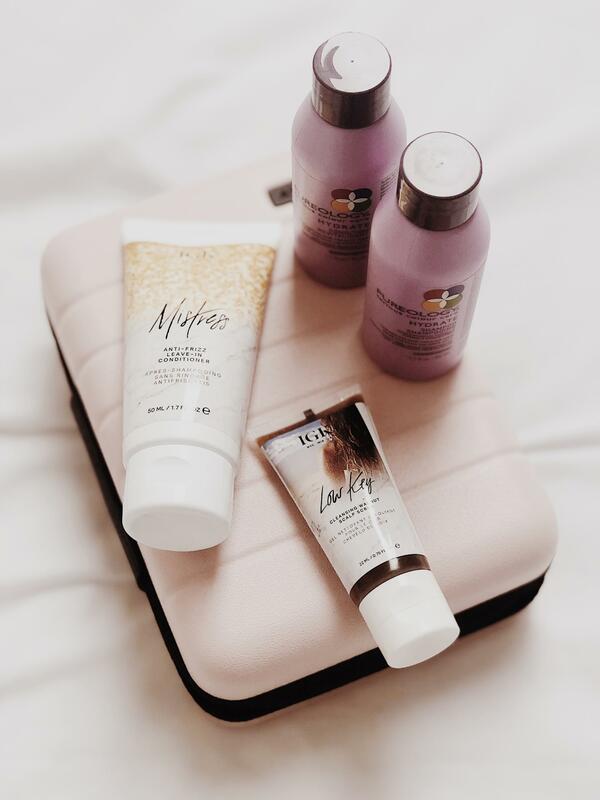 As for tanning I always take my mini Tan Luxe the face illuminating tan drops, I add these to my moisturiser in the mornings for an added radiance. 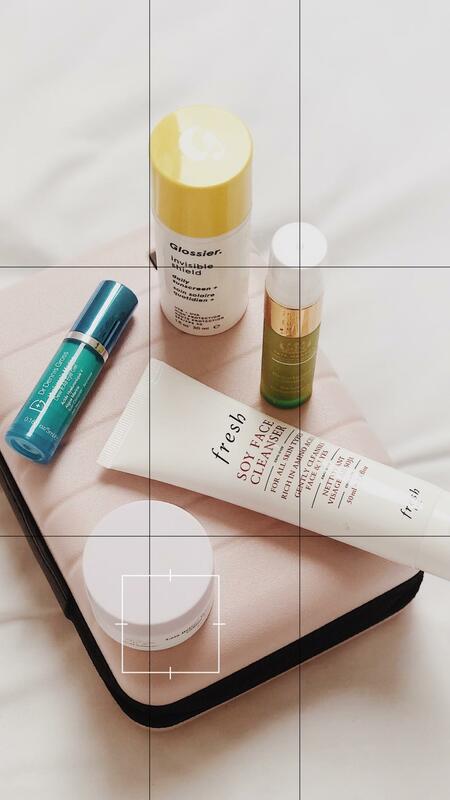 As for cleansers, Fresh Soy face cleanser is my go-to for a quick deep cleanse. I’ll always remove my makeup with either an oil then go straight in with a cleanser. For serums; Tata Harper resurfacing serum is gentle enough to use in the day time, to get rid of any dead skin cells and hydrate dry skin. Drunk Elephant B-Hydra serum – it’s lightweight and full of hyaluronic acid. 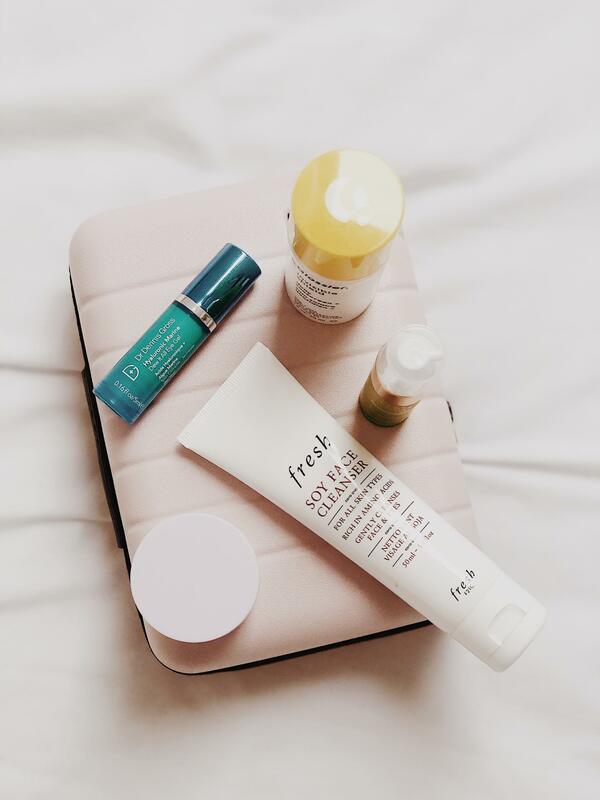 SPF is an absolute must in any skincare routine, my favourite is Glossier invisible shield SFP 30, it’s a gel like consistency which absorbs into the skin to hydrate and protect, it’s also invisible and has no white cast to it – perfect under makeup and for photos. Drunk Elephant Lala Retro Whipped Cream is lightweight, I have packed this cream to protect my skin in the sun and also the colder climates. Wearing this under makeup makes my foundation adhere to my skin. For eye cream, Dr Dennis Gross Hyaluronic Marine eye gel is packed full of hyaluronic acid, perfect for tired eyes and jet lagged eyes. Hydration is always key when it comes to my hair. Pureology hydrate shampoo and conditioner are the perfect duo to combat dryness and hair that breaks. This little duo comes everywhere with me. I’m trying out the IGK Low Key scalp scrub at the moment to help my hair repair itself and grow a bit longer, it’s sugar based so won’t strip out any colour and prevents further damage. IGK Mistress is one of my all time favourite hair protects and I’m thrilled to have it in a travel friendly size, it prevents frizz and hydrates dry ends – the perfect travel companion. For body and fragrance I always go-to Jo Malone; aren’t their miniatures the cutest! I’ve picked out Wood sage and sea salt as the fragrance and English pear and freesia as a body lotion, I’m going to smell amazing. 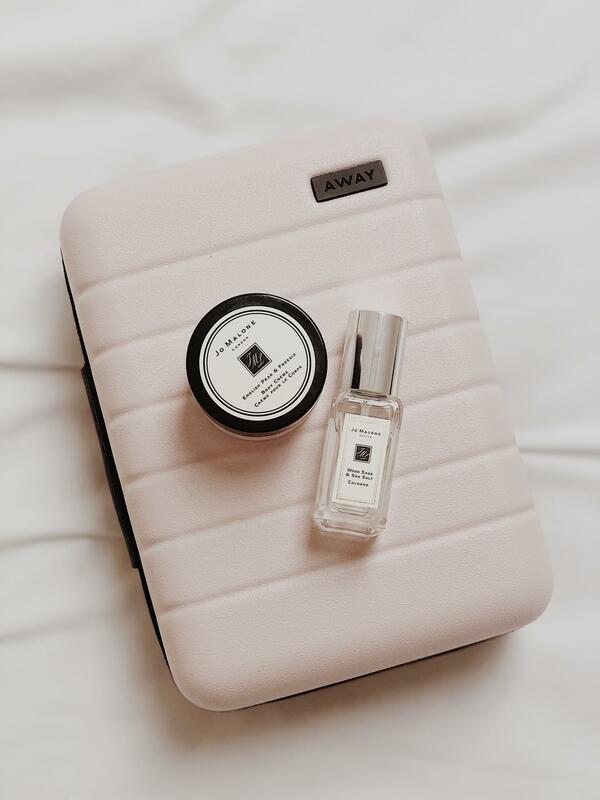 I’m packing all of my skincare favourites into my Away mini blush case – these we’re limited edition at Christmas time but they’re the perfect case for storing skincare and beauty items whilst travelling. The case is super sturdy and just looks so pretty. 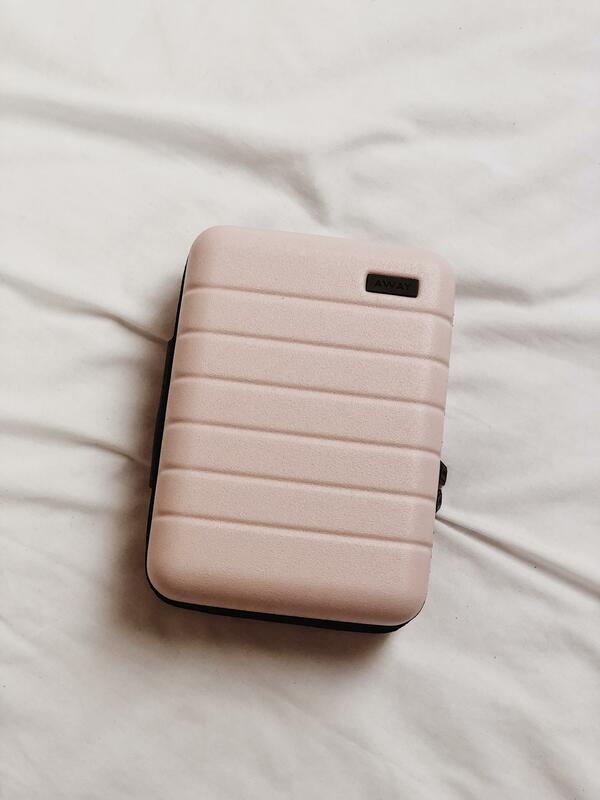 All of the products mentioned and extras such as cotton pads, buds and makeup wipes will also be stored in this case. I think I’ve packed pretty well for this trip – be sure to follow me over on Instagram to see my travels and holiday snaps whilst I’m over in the states. There will be a lot more travel content coming on the blog over the next month or so, I’m excited to visit new places and get fresh content.